At the end of September I took a train ‘up north’ to attend the Stitch Gathering with my good friend (and keen quilter) Lynsey. 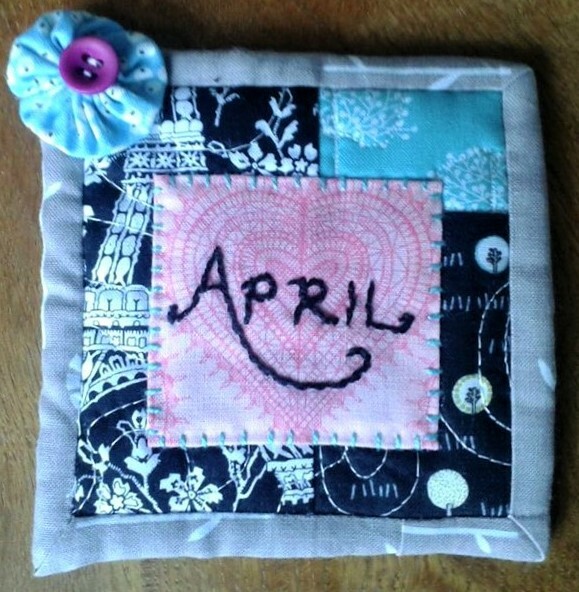 This annual meeting of quilting and stitching enthusiasts is organised by Jo Avery of My Bearpaw. A few months before the event we were sent a piece of Kona cotton and asked to use it to create our ‘ticket’ by embellishing it with our favourite word. Unfortunately, I didn’t quite manage to find time during the day to take photos of all the amazing tickets but Jo has posted photos of all the wordy creations on her blog so you can have a look if you’re interested. I had planned an elaborate appliqued creation using the word ‘hope’ but, as ever, time ran away with me and I ended up doing a bit of panic stitching on the train to Edinburgh. I thought that I’d treat myself to a cheeky G&T as a reward but was most put out to discover that there would be no trolley service due to a fault with the trolley! Having never attended such a large stitching workshop, I was a little apprehensive but I really needn’t have worried as everyone was very friendly and we were even provided with cake to accompany the stitching! During the morning, I attended a class taught by Fiona Calvert of Poppy Makes, who showed us how to make a Nosegay block using EPP. I’ll be honest, I didn’t accomplish a great deal as there were a lot of fiddly bits to cut out and I was having such a nice time sewing and chatting away that I didn’t notice the time passing! I finally finished the block last week! 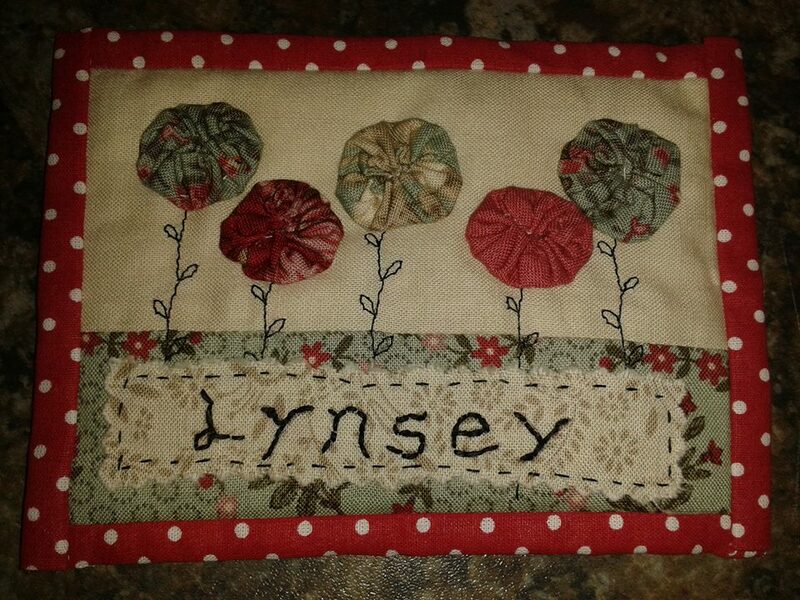 During the afternoon I also spent a bit of time doing some hand embroidery and the last session of the day was taught by Julie Rutter of Forest Poppy. 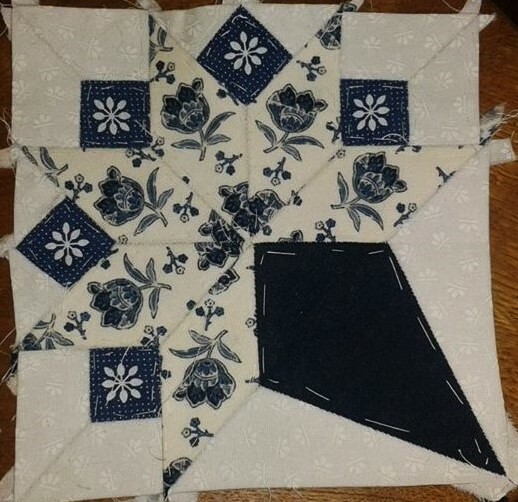 Julie showed us how to do a little bit of freeform piecing using scraps of fabric. I found it particularly liberating as you don’t really have to measure or cut the fabric accurately and it’s a much quicker way to sew! 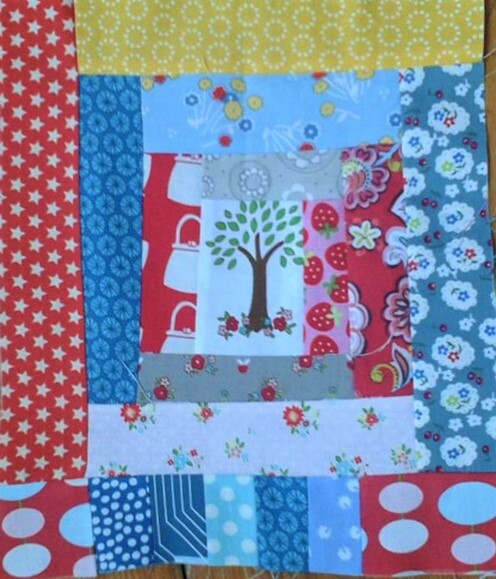 I made this freeform log-cabin block using scraps from Lynsey’s scrap bin and I have to say that I was quite pleased with it! I certainly intend to make a few more blocks using this technique. The husband gave me a book for my birthday called Sunday Morning Quilts which also features quilts made with ‘fabrics’ that have been pieced together out of several scraps. The day was thoroughly enjoyable and we were even given a goody bag with lots of lovely bits and pieces from sponsors. I really loved the beautiful Liberty hexies from Duck Egg Threads and have plans to use them in a few handmade Christmas presents. Yes, I mentioned the C-word!! It’s only about 5 weeks away! !